Orson Scott Card is the New York Times best-selling author of Ender's Game, The Tales of Alvin Maker, the Homecoming series, and many more. Ender's Game and its sequel, Speaker for the Dead, both won Hugo and Nebula Awards, making Card the first and only author to win both of those prestigious awards in consecutive years for a novel and its sequel. In fact, Orson Scott Card has received a total of 12 Hugo nominations and 3 wins, 7 Nebula nominations and 2 wins, plus the John W. Campbell award, the World Fantasy award, Margaret A. Edwards Award, the Whitney Lifetime Achievement Award, several Locus awards, and 3 nominations for the Mythopoeic fantasy award. 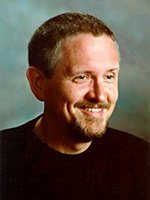 Matthew Peterson: My next guest is Orson Scott Card, New York Times best-selling author of Ender's Game, The Tales of Alvin Maker, the Homecoming series, and quite a few more. His novel Ender's Game and its sequel Speaker for the Dead both won Hugo and Nebula Awards, making Card the first and only author to win both of those prestigious awards for a novel and its sequel in consecutive years. In fact, Orson Scott Card has received a total of 12 Hugo nominations and 3 wins, 7 Nebula nominations and 2 wins, plus the John W. Campbell award, the World Fantasy award, Margaret A. Edwards Award, the Whitney Lifetime Achievement Award, several Locus ones, 3 nominations for the Mythopoeic award. . . . a lot of awards there. Thank you for being on the show today. Orson Scott Card: It’s nice to be here. Thanks for reminding me of how excited people used to be about my fiction. That hasn’t been happening in years. I won the awards and that’s nice. Nobody thinks of me for them anymore, I’m now so politically incorrect. Orson Scott Card: Yeah. It’ll never happen again. Matthew Peterson: You did get a couple just recently, the Whitney Lifetime Achievement and the Margaret A. Edwards Award. Orson Scott Card: Those were nice, to have librarians notice my work. Matthew Peterson: Yeah, yeah, that is. I mean that’s a lifetime achievement, so you definitely have done a lot. Orson Scott Card: No, I felt like my duty then was to . . . obviously the correct thing for me to do was die. Orson Scott Card: So, that I wouldn’t do anything to disgrace them for having, you know, nominated me for my life. But, no, they told me that that was not a necessary part of it. Matthew Peterson: You don’t have to die. Well that’s good! [laughs] Well, I spoke with Tom Doherty a while ago and he said that Tor has sent like hundreds of thousands of your books away to schools, just for free. Orson Scott Card: Well, they have been known to do that, though they’ve also been known to charge money. I’d hate to have anybody think that because their school didn’t get it for free that they’d been cheated somehow. That’s in times of promotion that they do that. Matthew Peterson: Well, Ender’s Game has been out for a long time, for a couple decades now and so . . .
Orson Scott Card: Yeah, sometimes I actually think that it was written before I was born, it’s so old now. Matthew Peterson: [laughs] Well I have to tell you. I do have a knack of guessing the endings of books and movies and stuff. But this one, it really took me for a loop. And my friend suggested this book to me and he warned me that there was a big surprise at the end, and I didn’t catch it till like right before it happened and it was very . . .
Orson Scott Card: Well, that’s cool. I’m glad. I think that for a lot of people it’s just seeing how few pages are left and we haven’t even gotten to the war, sort of is a give away. And the nice thing is that even when people do guess the ending, I’m not terribly worried because enough people tell me that they re-read the book. You know, I tell them . . . somebody says, “I’ve read the book seven times.” And I go, “Well, you know, it ends the same way every time.” And they laugh. Orson Scott Card: But you don’t read Ender’s Game really for a surprise. You read it, I hope, for the experience of the characters. Orson Scott Card: Yeah. Yeah, in fact, when you watch Titanic for the 2nd, 3rd, or 4th time you have to turn the sound off. If you don’t, then you have to actually listen to those poor actors struggling to say those lines as if a human would say them. Jim Cameron is a great writer, but not on that film, I mean, his dialogue was just embarrassing. Matthew Peterson: Well, you are really good with writing dialogue that is spoken well. I mean I listened to the audio books of the Ender’s Game, the whole series there, and the audio is wonderful. You have multiple people doing the audio book. Orson Scott Card: That’s because of Stefan Rudnicki. He has done a superb job of the unabridged recordings. The initial recordings of my work, it was in the era when all of them were abridged and my work does not abridge well. I don’t have filler. There’s none. There’s nothing that you can cut without removing sense from the story. And the abridgers just went crazy trying to cut Ender’s Game and Speaker for the Dead and the result was kind of a hatchet job. And then they had a reader [changes his voice] who read it rather like this. So that it became a stentorian declaration. Orson Scott Card: And, oh, man, that was a bad time. Now, it’s read in a natural voice. Stefan chooses superb actors, he changes readers, rather, with each point of view shift, so that you get a sense of the voice of the character, even when it’s the narration. I could not ask for a better audio production. So, I tell people, and I mean it, that the best way to experience any of my books is on the audio done by Stefan Rudnicki of Skyboat Road Production. Matthew Peterson: Well, I listen to a lot of audio books and I would have to say that Ender’s Game is just wonderful; it’s one of the best audio books out there. Like you said, superb execution with all the narrators. Orson Scott Card: And I will pass that along to Stefan, or else I’ll have him link to you. Matthew Peterson: Well, I’m a big audio book person. I was the narrator of my audio book. So, I’m a big fan of audio books. Orson Scott Card: I read them too. In fact for my magazine, InterGalactic Medicine Show, which is at oscigms.com we have a story each month that I read, I’m behind, but I read a story by somebody else. And I love doing it. It’s fun. Matthew Peterson: Yeah. Well, you have another series, too: Ender’s Shadow. That’s kind of like a companion, and also the audio books are with those as well. You know, when I was reading those, I knew that it was pretty much Ender’s Game, but in a different perspective, so I had never read an entire book like that. Sometimes authors will write a chapter, like in another perspective, but not an entire book, and I read that. And I didn’t know if I was going to like it, but I loved that book. I think I liked it just as much as Ender’s Game. Orson Scott Card: I’d like to think that in the twenty years between the books, I learned a few things. It’s less than twenty years, but I hope that I had become enough of a better writer that while the story was the same public event, that I was able to create a character who was in his own way as memorable as Ender Wiggin. Matthew Peterson: What made you decide to go back into that book and re-write it in a different perspective? Orson Scott Card: Oooh. I didn’t decide to. That’s the sad thing. It’s one of those terrible confessions. What I was doing was writing a book about Bean. It was going to be the first of a series of books about the other characters, just following their lives. And so I was going to do just a few chapters in Battle School and then move on. But I got caught up in Bean’s back story in Rotterdam and realized I wasn’t even getting him to the Battle School until many chapters after he was supposed to be leaving. And finally I had to call up my editor, Beth Meacham, and just say, “Beth, this book is just going to be parallel to Ender’s Game. The logical place to end it is where Ender’s Game ends.” And she laughed and said, “Oh, I’m not surprised,” because nothing actually surprises Beth. And so she went along with it, Tom Doherty went along with it and we ended up with this parallel series, but it was quite accidental. I had no intention of doing any such literary project. Matthew Peterson: It was almost a decade since you wrote a book from the Ender Wiggin saga. And the War of Gifts and Ender in Exile just came out last year. Why was there such a big gap in between? Orson Scott Card: I had nothing to say. You know, I won’t write a book just for the sake of writing it. There actually has to be a subject matter. And so, while I knew that I intended to do more books, I had to wait until I had a story that I cared about. I have to care about and believe in a story before I can write it. Which means hack work is really quite impossible. I wish that it were possible. I would love to imitate my most successful books and duplicate them over and over again, because I could use the income. So it’s not a matter of some deliberate integrity; it’s sort of an accidental integrity where unless I really care about the story, I just can’t tell it. My eyes glaze over. I fall asleep at the computer. I just resist books I don’t believe in, and I end up not writing them. And so it has to be a story I care about. That’s what I was waiting for with Ender in Exile. And in a way it’s re-visiting the original Ender’s Game and telling it as . . . what can I say . . . kind of a different story now. Matthew Peterson: And it doesn’t take place at the end of the saga. You kind of inserted it right in there. Orson Scott Card: It’s almost a replacement for the last chapter. If you stopped right before the last chapter of Ender’s Game and then switched over to Ender in Exile, you would have a better book. However, it’s a whole book and, you know, by the time you reach the last chapter of Ender’s Game, you’re ready for it to be done, so in essence, that’s kind of the summary of the events right after. And then Ender in Exile is the much deeper exploration of those events. Matthew Peterson: And I heard we might get another book also: Shadows in Flight. Orson Scott Card: Yeah, Shadows in Flight is planned to be after Children of the Mind and a direct sequel to Shadow of the Giant. So, it brings the two series back together again at the end. Matthew Peterson: Awesome. [laughs] Any idea when we might be able to see that one? Orson Scott Card: They always make me write them before they’ll publish them, it’s . . .
Matthew Peterson: Oh, it’s just one of those things. Orson Scott Card: They just insist on it. Matthew Peterson: Well good. Well, I’m so excited to read those books as well. I’m a big fan. I’ve been speaking with Orson Scott Card, New York Times best-selling author of Ender’s Game, and quite a few other great books. Thank you for being on the show today. Orson Scott Card: My pleasure. Matthew Peterson: Well, that’s it for today. Be sure to visit www.TheAuthorHour.com to listen to the bonus questions. Next week I’ve got a vampire-themed episode with Charlaine Harris, Laurell K. Hamilton, P. C. and Kristin Cast, and L. J. Smith. See you then.